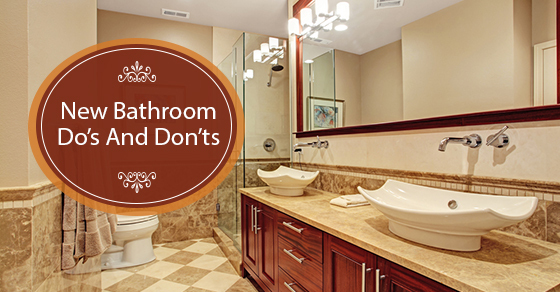 Adding a new bathroom to your home can dramatically increase the value of your home. A full bathroom could potentially increase its value by 20%, while adding even a half-bath could increase it by up to 10.5%. However, there are many aspects to tackling this project, many of which are best left to the professionals. You need to have a solid understand of plumbing systems, for example; otherwise you could find yourself having to make costly repairs in the future. To make the process as smooth and as economical as possible, there are a number of things you want to do and a number of things you don’t want to do. Determine the extent of any plumbing and electrical changes that will be necessary to be up to code. If you pipework is old, it is imperative that you update it so that your water pressure is not reduced due to debris that has built up in your pipes. Pay particular attention to the drain vents, ensuring that the type and size of pipe you use is in line with current code. One of the easiest ways to add a new bathroom is to connect it to the current plumbing you have in place. Ensure that your current plumbing can handle these increased demands. This is especially important for those on a septic system. To save you both time and money in the event that you make a wrong move during your bathroom installation, it is a good idea to have a professional come over and show you the basics of plumbing. hidden water damage, perhaps due to a leaky shower pan. Ensure that you account for unexpected costs in your budget. Feel free to take on the demolition or painting aspects of your bathroom installation yourself, but don’t overlook the importance – and necessity – of a skilled plumber or electrician to take on the more intricate aspects of the installation. In short, avoid as many DIY projects as possible. If you are in need of professional plumbing, heating or water services during your bathroom installation, contact Brothers Plumbing today. With over 50 years in the industry and affordable rates, you will not regret having a professional step in when you need it most.